The Ejendals Tegera 118A Welding Gloves are medium leather work gloves with heat-resistant properties. Made with full grain goatskin and split grain cowhide, the Ejendals Tegera 118A have good levels of fingertip sensitivity for fine handling tasks. Featuring the ability to withstand contact heat up to 100°C as well as providing protection against sparks and grinding splash, the Tegera 118A are suitable for welding and other hot work applications. 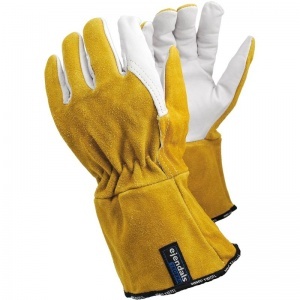 The Ejendals Tegera 118A Gloves are supplied in a yellow/white design with a safety cuff for additional protection. They feature an elasticated 180° fastening at the wrist for a comfortable fit. The product code for these gloves is 118A. Through this listing, you can purchase the 118A Welding Gloves in case quantity, getting 60 pairs of gloves at a discounted price. Ideal for welding and metal fabrication businesses, this Bulk Pack allows you to save money on your essentials. With each glove being made to the highest quality, this bundle is sure to last even a large-sized enterprise a significant amount of time. The Ejendals Tegera 118A are offered in six different sizes, the dimensions of which can be found below. To measure your hand, measure the circumference of your hand around the knuckles (excluding the thumb) with your hand open and your fingers together.